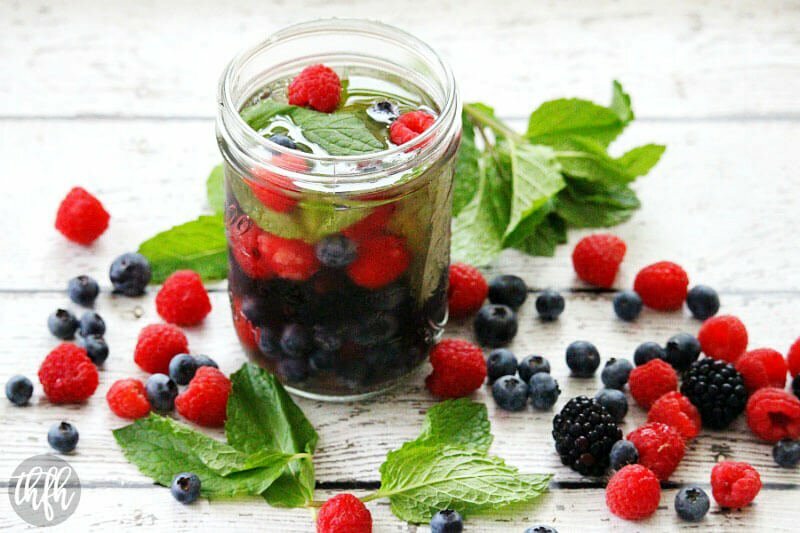 This Fresh Berry and Mint Spa Water beverage is perfect for the summer heat and my recipe submission for The Recipe Redux’s May theme. Since I don’t consume alcohol, I thought I’d share with you a way to bring some excitement to your plain water as you try to beat the heat this summer. With the temperatures reaching the high 80’s this week in Southern Louisiana, staying hydrated is always important. And summer isn’t even here yet! Luckily, I drink a lot of water anyway. Really, a lot! So much so, I have a 4-gallon Berkey water filter that I use to make sure the water I drink and cook with is clean and pure. I used to use a water distiller that would capture all the impurities from the tap water, and I can’t even post the photos here they are so disgusting. Rust, unknown floating particles and the most obnoxious smell was left over in the reservoir tank each time after I made a gallon. Seeing what was removed from the tap water was enough to change me forever and now I never drink tap water. I had to switch from 1-gallon water distiller to a 4-gallon Berkey because it just couldn’t keep up with our water demands. We use it for drinking water, coffee (husband), tea, boiling pasta water, recipes, soaking nuts/seeds, in my essential oil diffuser and any other reason you would need clean water. I even take a smaller travel size Berkey with us on vacation when we travel. As with all my recipes, I try to emphasize the importance of using quality ingredients – even in this simple recipe. A simple Google search will tell you how bad tap water is for you, so you’d want to use clean, filtered water. You wouldn’t want to use non-organic fruit that’s been sprayed with pesticides soaking in water that you are going to drink. And you wouldn’t want to drink your water out of a plastic BPA water bottle. So take the extra steps and use clean water, organic fruit and a glass water bottle for a light and refreshing summer beverage to help you stay hydrated. Want more healthy juice recipes? Check out Beet and Celery Juice, Carrot Apple and Celery Juice, Clean Eating Bloody Mary (Non-Alcoholic) or my Clean Eating Cookbook with over 140 healthy, clean eating recipes you will love! Important: To make sure you have the healthiest spa water possible, use filtered/purified water (not tap water), use organic fruit and use a glass container (not BPA plastic). Add all ingredients to a glass container (I like to use a mason jar), cover it and leave it in the refrigerator overnight. It will be ready to enjoy the next day. You can refill your glass throughout the day with more filtered/purified water and when through, you'll have a glass of berries to enjoy! 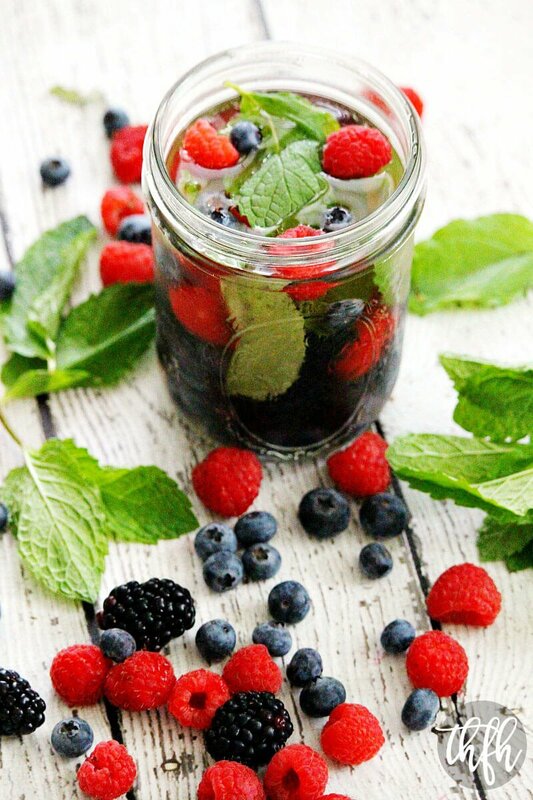 The recipe and photographs for "Fresh Berry and Mint Spa Water" by Karielyn Tillman of The Healthy Family and Home website are licensed under a Creative Commons Attribution Non-Commercial No Derivatives 4.0 International License and cannot be used without my written permission.